What are the consequences of becoming a “covered expatriate” for failing to comply with Section 877(a)(2)(C)? Many lay p ersons are stumped as they try to understand the tax consequences of Sections 877 and 877A. The language in the drafting of the statutes is not so clear. Be careful to understate the meaning and how the IRS interprets the law. One of the greatest risks for anyone who wants to self-diagnose their path towards becoming a former U.S. citizen, is Section 877(a)(2)(C). To be blunt, anyone who renounces their citizenship at the Embassy or Consulate will find that process relatively easy. However, no one at the U.S. Department of State will provide tax advice or try to interpret the meaning of Section 877(a)(2)(C). Indeed, the Foreign Affairs Manual used to read to the person taking the oath, simply provides the standard overview language of “special tax consequences” arising form the renunciation. The provision is clear that anyone who does not satisfy it, will be a “covered expatriate” and hence subject to the taxation and reporting requirements under Sections 877 and 877A and 2801. This is worth understanding well, before rushing off to take the oath at the U.S. Embassy or the U.S. Consulate. This entry was posted in Certification Requirement of Section 877(a)(2)(C), Penalties, Tax Compliance. Should the U.S. government consider it a positive development that about 3,000 citizens renounced in 2013? Where is the authority for treating someone as a covered expatriate if they make the certification a couple years late? And if you’ve already missed the 8854 deadline, why even bother checking that box when making a late filing? This provision of the law raises a number of issues. Will the IRS interpret Section 877(a)(2)(C) as allowing a taxpayer to certify many years after the renunciation of U.S. citizenship? 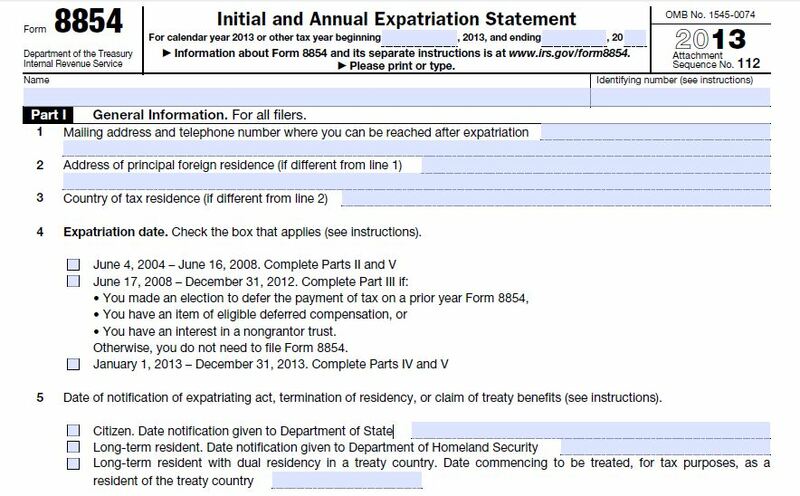 What if someone has relinquished their citizenship many years previously, but the U.S. Department of State will not acknowledge it until several years after the fact? Will the government argue the person is a “covered expatriate” (assuming they do not meet the income tax or net worth tests)? It is clear that failing to comply with Section 877(a)(2)(C) will cause one to be a “covered expatriate”. The next issue becomes how much tax (if any) will be owing? How will the IRS try to enforce the failure to comply with Section 877(a)(2)(C)?